Forecasters have been prognosticating mortgage rates would begin to rise going into 2015 as the Fed tapers its bond buying program and most believe this is true. However, we’ve heard fears of deflation and 10 year bond yields have fallen below 2%. This is due to several factors including an economic slowdown in China, Europe, as well as fears of Ebola. Ebola is one of those wildcards we’re thrown every once in awhile that makes it difficult to predict what will happen to the world economy. Buyers are taking advantage of the dip in rates too as we listed and sold several homes this past week that sold in a day. Buyers who have been shopping for any length of time are tired of getting beat out by other buyers for hot new properties that enter the market. 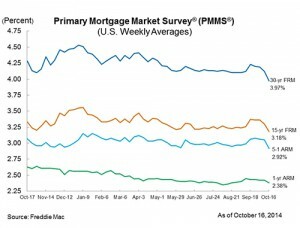 They’re also watching the interest rate market as a dip in rates means they can afford a larger mortgage with the same monthly payment with the new lower rates. This is important in a rising price market like we have here in SW Florida. When prices rise, it raises the monthly payment for a buyer if nothing else changes, or it drops them into a lower tier home if they cannot afford the higher payments. 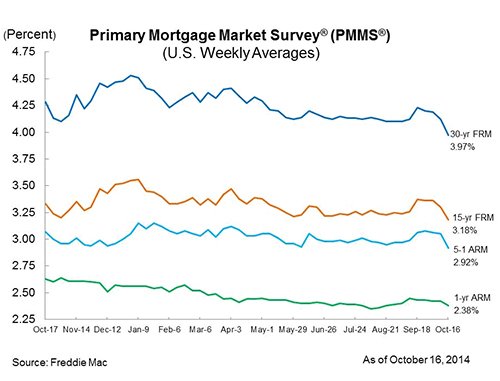 Lower rates are a nice surprise, especially in a rising market. Because home prices are expected to be higher next year than this year, and because rates are expected to be higher next year as well, it really pays to jump on that house when it hits the market and go after it hard. Even if you overpay a little bit now, it can save you thousands in a few months when rates rise and prices rise. At our team meeting this week our buyer specialists were talking about helping buyers in the $100,000-$120,000 range and how difficult it was for them as each home they were interested in had multiple offers. Basically it’s come down to setting up alerts on the MLS and notifying our buyers instantly when a new home enters the market and writing an offer within hours. Multiple offers are still a possibility, but it’s the only way these buyers are going to have a chance at landing a home. They just can’t go higher and there is limited inventory. This is happening in several price ranges. We just had a home come on the market in the $450,000-$500,000 range and it went pending in one day and we have several more buyers begging for a call if anything happens on this transaction. It’s good news for sellers and terribly frustrating for buyers. Our advice is work with an agent who will study the market for you and guide you. If what you’re looking for has limited inventory, jump on a new listing that fits your needs and will work for you, and is priced fairly in the market. If it’s well overpriced you may not have to worry. Some sellers are delusional even in a seller’s market and you just have to let those go. However, the seller may not be as delusional as you might think in some cases. If the property is unique or has something drawing you to it, chances are it may be drawing other buyers as well. Views, extended lanais, or remodeled kitchens and baths might bring extra value. You can’t just look at dollar per square foot. Appraisers don’t work solely off that and neither should you. Rather it’s best to make specific adjustments for certain items based on market conditions. It pays to work with a Realtor that knows the market. This is true buying or selling. To search the MLS for free check www.TopAgent.com If we can help, please call us at 239-489-4042 Good luck and enjoy the interest rate break! Posted in Cape Coral, Cape Coral Real Estate, Fort Myers, Fort Myers Real Estate, Southwest Florida Real Estate.Tagged 239-489-4042, Ebola, Freddie Mac, Mortgage Rates, SW Florida.